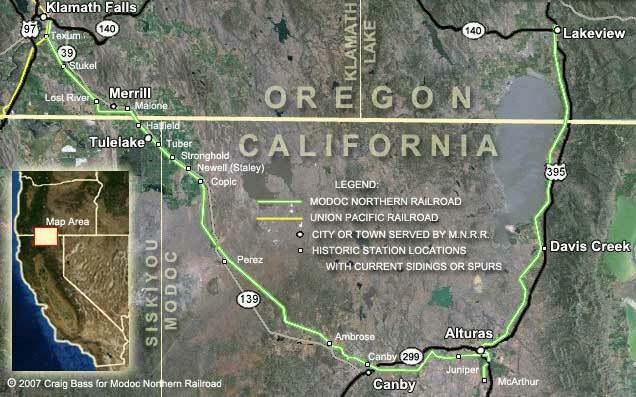 On November 1, 2005, operation of the Klamath Falls, Oregon to Alturas, California segment, the last remaining part of the Southern Pacific's Modoc line, transfered to the new Modoc Northern Railroad under a five year lease option with Union Pacific. Although the name "Modoc Northern Railroad" is in itself historic, it was never actually used for an operational railroad until this time. In late 2006, Lake County (Oregon) commissioners requested Modoc Northern Railroad assume the management and operation of the Lake County Railroad, which runs from Lakeview Oregon to Alturas, California. For almost four years the railroad brought new life to the old Modoc line, investing untold man-hours in rejuvenating historically poorly-maintained track on the Lake County branch and trying to rebuild traffic in the entire Lake County-Alturas-Klamath Falls corridor. Sadly, the Modoc Northern is now a "fallen flag." On May 5, 2009, Union Pacific terminated the MNRR's contract and took back over the operation of the Modoc Line from Klamath Falls to Alturas. Lake County also soon terminated their lease and retained a new operator.